Vismara has always been the place where owners can enjoy a company able to scientifically support their choices. Vismara is working with the best professionals to offer an engineered platform on which a fast-cruiser can be developed and built. The Vismara V67 Mills was born. From the experience acquired by Vismara Marine in building the Vismara V62 Mills, a truly success, this new fast cruiser was based on the same philosophy: lots of innovation for a boat built on time and on budget, hand to hand with the customer. The deck plan is designed to get all manoeuvres easily accessible from the cockpit. Four electric winches provide the crew full control on all operations at any speed, as well as on a race, the crew is able to trim the sails using the hydraulic system with two cylinders able to move in & out and up & down of the clews. With its hydraulically powered lifting keel offers a draft from 2.40 m to 3.60 m and is built in steel laminate structure Weldox with a torpedo lead. 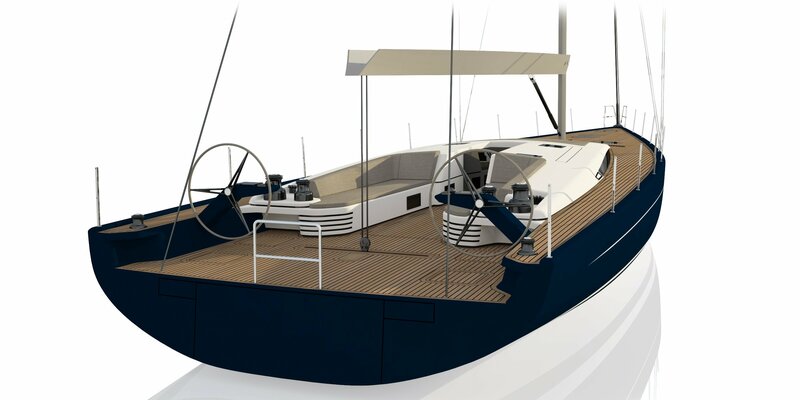 Style and design are conceived to face the sea elements and satisfy the most demanding owners. That’s why everything has been developed in full harmony with Vismara Marine style, lightweight composite material able to meet the highest standards of quality without increase the displacement and offering the longest durability. The furniture is a structural element of the boat, the backbone, to guarantee rigidity to the overall structure and comfort to the crew both at sea and at the anchor.